It won’t please everyone, but for my money, Interstellar is up there with director Christopher Nolan’s best. It comes as little surprise that Interstellar is easily Nolan’s most emotive piece of filmmaking to date, since the project was shepherded by none other than Spielberg during the early screenwriting process. As big a Nolan fan as I am, his films do have the tendency to be rather cold, calculating affairs. Batman Begins had quite a lot of heart, and Inception had moments here and there, but The Prestige, The Dark Knight and The Dark Knight Rises barely registered on the emotional scale. 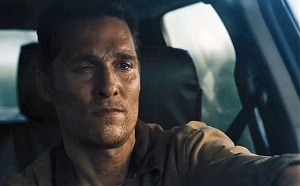 Interstellar shows us an Earth mid-apocalypse, and Matthew McConaughey stars as Cooper, the leader of a space faring expedition that sets out to save the human race. He’s surrounded by the likes of Anne Hathaway, Wes Bentley and David Gyasi. The screenplay, written by the brothers Nolan, is practically flawless. Whilst the film may be epic in length, it doesn’t waste any screentime, and there are a half a dozen moments where the film, almost shockingly, cuts straight to the meat of a scene straight away. There’s no faffing about. Part of the genius of the filmmaking is that Interstellar seems future-proofed, in the sense that the film won’t date. There’s nothing about the costuming, set designs or hardware that screams 2014 – in fact, it doesn’t seem to be from any particular time period whatsoever. There are moments that feel distinctly late 70s/early 80s, but this may be because that’s the last time we were truly excited at the prospect of going into space. The film also holds back the visual effects too, whenever possible. Despite the fact our heroes are zooming through space, we hardly ever see their craft from the outside. Most of the time, our field of view is the same as the astronauts’. This admirable restraint means firstly that the visual effects won’t date as badly as other films of its ilk (I’m looking at you, Contact), and secondly that the effects never push the envelope too much and become dodgy-looking, something that happens in the majority of effects-laden films. By this stage in his career, it will shock no one to learn that McConaughey is great in the lead role. Mackenzie Foy also deserves props as his daughter, providing some of the film’s most powerful scenes. The fact that the totally inhuman looking robots, TARS (Bill Irwin) and CASE (Josh Stewart) steal the show is testament to the voice actors’ performance and the brilliance of the script also. Hans Zimmer stuns us all again with his score. Though the audio mix means that it frequently drowns out the dialogue, the music is phenomenal – and not immediately recognisable as his work either, which is a nice change. If anything, it has echoes of Philip Glass, with organs repeating the same phrase over and over. I can see that Interstellar will be divisive. Some storytelling decisions are bound to disappoint some, but for me they make perfect sense, considering the impossible situation constructed by the narrative. At the end of the day, it’s all about the fear of being alone. This is a profound science fiction film that echoes 2001: A Space Odyssey, Contact and the more sombre moments from The Black Hole, and one that deserves to be seen on the big screen. This entry was posted in Film Reviews and tagged Action/Adventure, Disaster, Drama, Science Fiction by Stuart Wilson. Bookmark the permalink.